Vikings is an English-spoken Canadian historial drama series about the Norsemen of Early Medieval Scandinavia, and their raiding and trading at the beginning of the Viking age in the first century. More specifically, the series focuses on Ragnar Lothbrok (played by Australian actor Travis Fimmel), a young farmer who out of discontent with his leaders rises through the social ranks to eventually become a Scandinavian king. 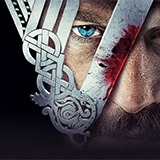 The story of Vikings is loosely based on the legendary tales of Ragner Lothbrok himself as described in several historical accounts and Norse folk tales. The series is mainly recorded in Ireland, with some scenes being filmed in parts of Norway, for the Canadian channel History. Ivar is treated to a surprise, Hvitserk is severely tested and Floki makes an amazing discovery. Three Danish Kings massed their armies in Reading and Ubbe’s negotiations may have a perilous outcome. Bjorn achieves one of Ragnar’s dreams and King Alfred faces his greatest threat yet. A new plan is conceived while Ivar prepares for a divine arrival and a settler returns to Iceland in terrible condition. Bishop Heahmund is wracked with guilt as he fights to renounce his passions. Vikings will clash with Saxons on the battlefield leaving a key figure lost in the calamity. Contrary to the celebrations in Kattegat, grief hits Iceland and Floki must now make a fated decision. Harald’s army approaches Wessex and a conspiracy grows against King Alfred in Court. Heahmund fights to convince King Alfred of his religious intents in defense of the Crown. Ubbe and Torvi strengthen the position of the Vikings but not everyone supports their strategy. Another settler disappears in Iceland. Heahmund’s loyalty is tested creating an uncertain fate for those in his company. In Iceland, Floki fights to understand the will of the gods and the new ruler of Kattegat may have met his match.